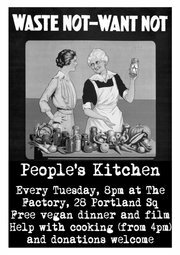 "Bristol People’s Kitchen is a donation-based community dinner that happens at the Factory (2-8 Cave St/Portland Sq) every Tuesday at 8pm. We collect food from supermarkets, markets etc that would otherwise go to waste and use it to cook for 40 – 50 people every week. The meal is always vegan and there’s usually a wheat-free option. We welcome donations of all kinds – food, time or money!"